The party starts at 7PM @ Harold's Place chickee bar. Check in with a Non Stop Naples rep, and get your NSN wristband. Enjoy light appetizers while waiting for everyone to arrive, and get to know your fellow party-goers. The bus will depart for Pelican Larry's 951 ~ 8PM. There will be beer, jello shots, and lots of great raffle giveaways on the bus. 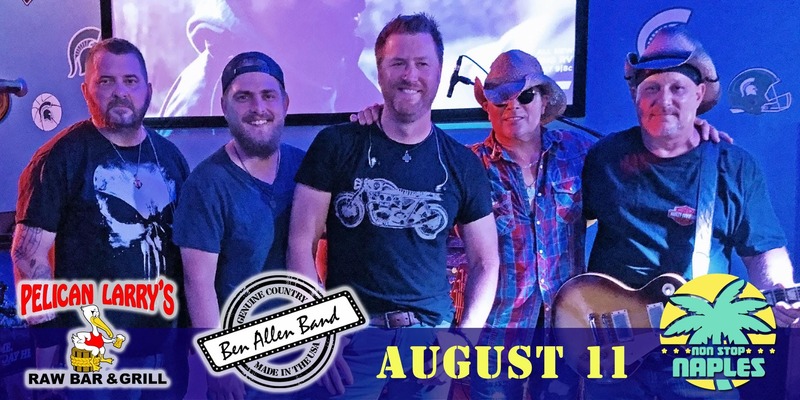 Once at Pelican Larry's, your wristband gives you entry to the VIP room, where there will be a meet and greet with Ben Allen!! The VIP room is directly across from the stage, and will have 2 dedicated servers. More light appetizers will be provided during Ben's performance. The bus will return to Harold's Place and The Gulf Coast Inn once at 10:45 for those needing to leave earlier, and then again at 12:30 when the show is over. Don't live close? For those of you who don't know, Harold's Place is located at The Gulf Coast Inn of Naples. They've got great rooms, food, and entertainment. Mention this event and get a special Non Stop Naples Summer rate of $85 for the night!!! Hang out at the Harold's Place Tiki Bar the next day, relax by the pool, or even join in karaoke. You can check out all the places we will be visiting in the Non Stop Naples App! It's free to dowload, and you'll discover where to eat, drink, play, and stay - along with access to rewards and coupons all over town. It's going to be a night to remember, so definitely check it out!